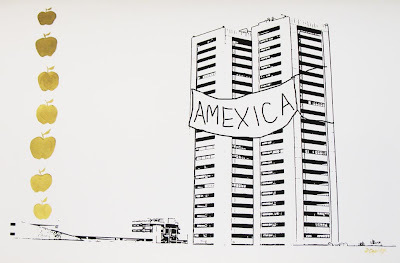 This work is based on the ideologies that are being constructed in the media about the potential convergence of Mexican and American cultures. The words on the signs are a mixture of two words. They were taken straight from the mouths of Glenn Beck and Lou Dobbs themselves. They are spoke by those men in media in a negative and looming doom kind of manner. 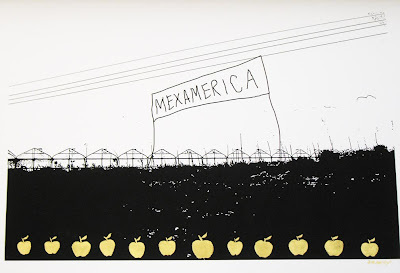 "What will happen when our America becomes Mexamerica?" These concerns are turned in on themselves in this work. I create a banner with these 'bad' words on them in order to welcome the new world of two cultures. With golden apples lining the pieces, I hope to bring to mind the idea of a world where if ignored and pushed away will result in increased prices due to a lack of workers. Also to represent the importance of the work that migrant workers do and the increased value of their contribution to our society. I am a world citizen who is interested in making art for and by the people of the world. I am intrigued by photography, culture, politics, and the magic of the unseen.